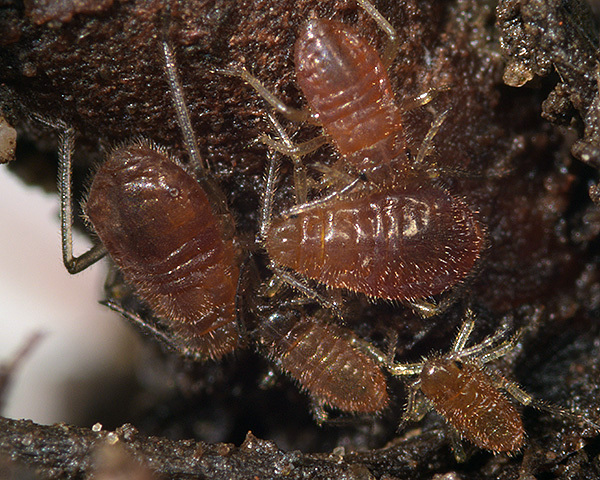 Maculolachnus submacula apterae (see first picture below) are yellowish-brown, reddish-brown or dark chestnut brown. The dorsum has many fine hairs placed on small scleroites. Their dark brown antennae are about half the body length and the antennal terminal process is less than 0.25 times the length of the base of the sixth antennal segment. The legs of Maculolachnus submacula are dark brown, except for the bases of the femora and middle parts of tibiae. The hairs on the tibia are about half the diameter of the tibia. The siphuncular cones are dark and also have many hairs. The body length of Maculolachnus submacula is 2.7-3.8 mm. 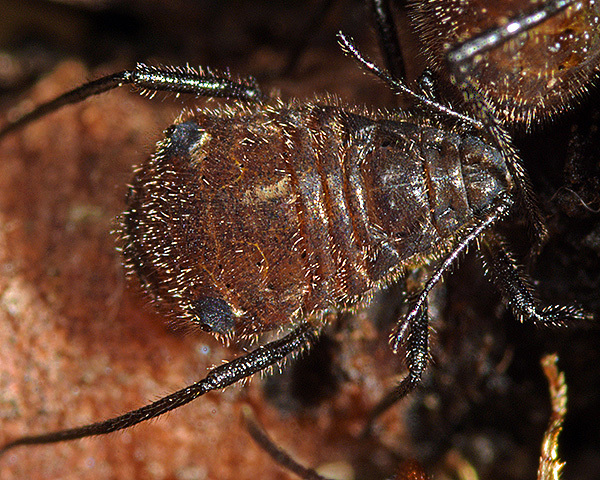 The alate Maculolachnus submacula (not pictured) is dark brown or bronze brown, and has a dark spot on its forewing between the pterostigma and base of media. Antennal segment III has 5-10 secondary rhinaria and segment IV has 1-3. Immatures (see second picture above) are a little paler than the adults. Maculolachnus submacula feed on Rosa species (including roses). Much of the year they feed on stems near the ground, but in summer they move to the surface roots. 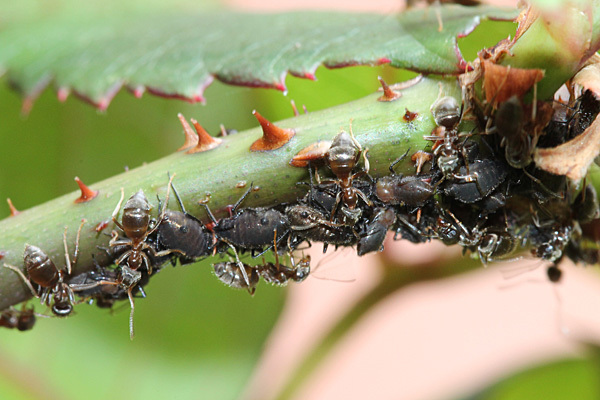 Colonies are tended by ants which often tent over the aphids with soil particles. They do not host alternate. Oviparae and apterous males are found in September-October. Maculolachnus submacula are distributed throughout Europe eastward to Ukraine, Kazakhstan and India. Although Maculolachnus submacula seems to be common in much of Europe, finding it in Britain was something of a special event. We have only found it at one site in Britain - on rose bushes in an East Sussex village. 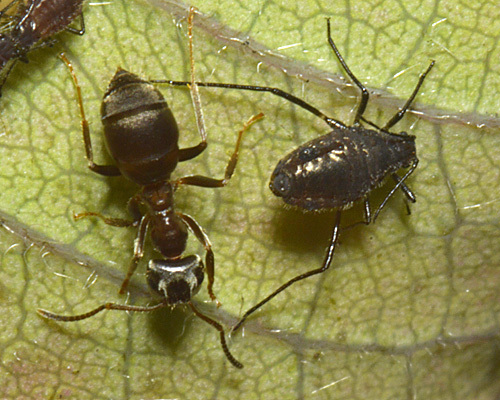 The aphids were feeding on the stems near the ground and were closely attended by Lasius ants (see second image below). In January 2015 we received an identification query for aphids on rose (see picture below) from Thomas Legrand in Oxelaere, in the north of France. 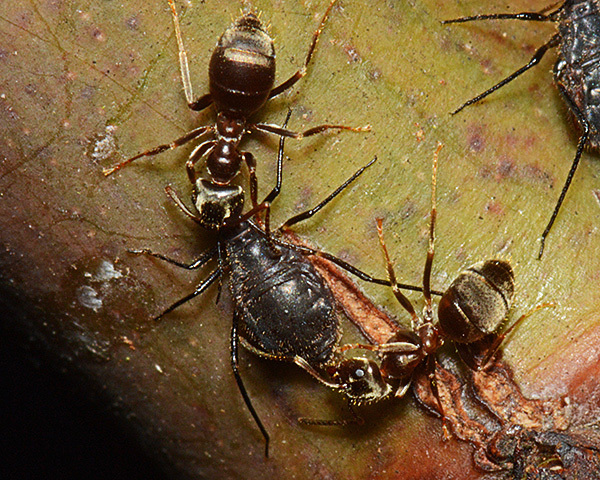 These too were Maculolachnus submacula and were also attended by ants. Although both colonies were ant attended, they were not tented over with soil particles - unlike those found by Simon Leather Don't Forget the Roundabouts. We suspect the tenting over with soil is mainly done in summer, partly to protect the aphids from predators and partly to maintain a high humidity. 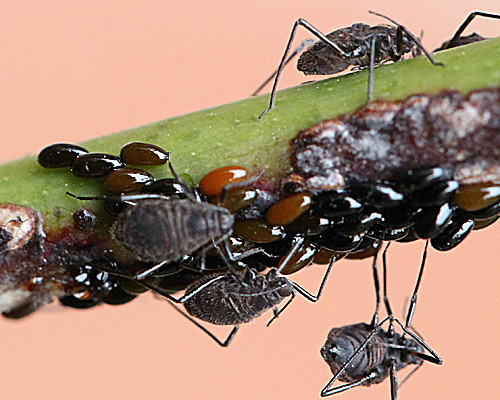 There have been a few studies carried out on the ecology of the rose stem aphid. Gottschalk (1989) describes the biology of Maculolachnus submacula and describes the sexuales (males and oviparae) of this species. 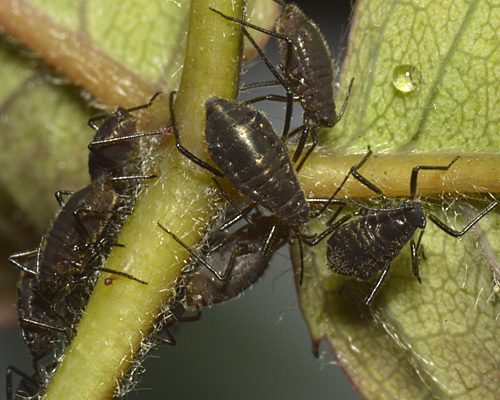 Jaskiewicz (2003) describes the species composition and number of aphids on rose bushes in urban conditions over three years. Maculolachnus submacula fed on the lignified shoots of roses from April till November. Their numbers varied over time with peak numbers in May or June. Maculolachnus submacula remained on the rose shoots longer than any of the other other aphid species inhabiting these plants. Kmiec (2007) sampled four varieties of rose on 28 occasions over 3 years and calculated a constancy index (the percentage of occasions when the species was present) for each of seven species of aphids. Maculolachnus submacula was mainly found on noble roses but its constancy varied greatly between sites. The picture above shows a large batch of eggs laid by Maculolachnus submacula on rose in northern France. Lubiarz & Cichoka (2014) carried out a fascinating study on aphid egg predation by Coccinellidae. 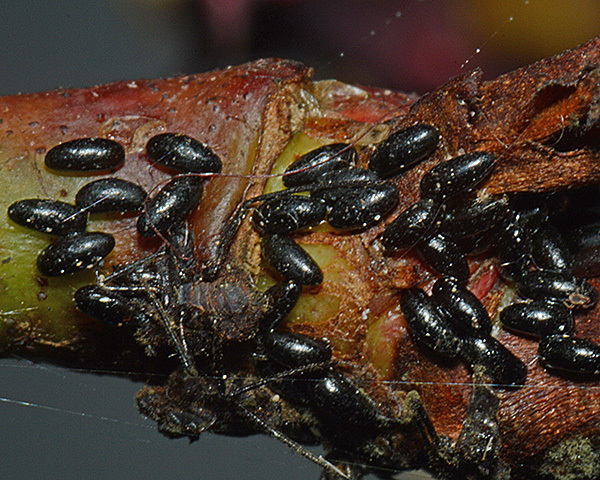 One of the aphid species considered was Maculolachnus submacula which laid eggs in three locations on grandiflora rose plants. Ladybirds destroyed 31% of those eggs in autumn 2011 and 14% in spring 2012. In autumn 2012, they destroyed 42% of the eggs. In spring 2013, 14-20% of eggs were destroyed. In 2013 the process was observed: Ladybird beetles foraged for several hours per day, either eating out holes in egg patches or placing themselves in the middle of an egg-ring encircling a shoot, and eating their way round the shoot. The ladybirds bit into the tops of eggs and ate out the egg interior. The destroyed eggs often fell off the plants, leaving visible gaps in egg deposits. Maculolachnus submacula reappeared in 2015 on the same roses in an East Sussex village that we found them on in 2014. Aphid and ant activity continued on the plants at least up till late December, with the ants vigorously tending the aphids (see first picture above) and the aphids laying huge numbers of eggs (see second picture above). This activity was doubtless enhanced by the exceptionally mild weather in Britain in December 2015. Maculolachnus submacula has been recorded from 19 Rosa species. Blackman & Eastop list about 70 species of aphid found feeding on Rosa (rose) species worldwide (with formal identification keys), and Blackman & Eastop (1984) list thirty-or-so species of aphids that feed on cultivated 'roses' worldwide. Of those aphid species, Baker (2015) lists 12 as occurring in Britain: Chaetosiphon fragaefolii, Chaetosiphon tetrarhodum, Longicaudus trirhodus, Macrosiphum euphorbiae, Macrosiphum rosae, Maculolachnus submacula, Metopolophium dirhodum, Myzaphis bucktoni, Myzaphis rosarum, Rhodobium porosum, Sitobion fragariae and Wahlgreniella nervata. Jaskiewicz (2003) commented on the damage caused by Maculolachnus. They fed on young twigs in spring and caused twisting, bending, growth-inhibition, and even dying-out of the shoot-ends. Our particular thanks to Thomas Legrand for his images of Maculolachnus submacula. Blackman, R.L. & Eastop, V.F. (1984). Aphids on the world's crops: an identification guide. J. Wiley & Sons, Chichester, UK. Gottschalk, H.J. (1989). Zur Verbreitung von Maculolachnus submacla (Walker, 1848) in den Nordbezirken de DDR und die Beshreibung der Sexuales (Homoptera: Aphidinea: Lachnidae). Entomologische Nachritten undBerichie 33, 161-163.